I refer to the Sunday edition of the Fiji Sun dated July 1, on Page 3 where Sitiveni Rabuka is boasting where he claims that his former Soqosoqo ni Vakavulewa ni Taukei (SVT) party government started the Free Tertiary Education. But why not affect changes from pre-school through to Year 13. I personally would like to challenge Rabuka to come out in the open and give the public a breakdown of all those who benefited from such scheme during his tenure. I am one hundred per cent sure that majority of those recipients would be the “who you know” selected few, personal friends and relatives who did not qualify on merits. I am also privy to the names of the many who failed or performed below par from their Form 6 exams in the 90s, but were given space to study at USP or FIT through the Free Tertiary education. But I wish to take nothing away from them as they were fortunate to be accorded the opportunity as opposed to those who persevered, did the right thing by themselves and sacrificed under difficult conditions and passed with colourful marks, but denied the chance and were discriminated against. The visionary FijiFirst Government revolutionised our Fijian education system by providing free education from pre-school, Year 1 to 13, with the Toppers Scholarship for the elite smart first 620 Fijian students from Year 13 in any school around the country. It is a lifeline to all our children. But for the first time all or any of our school-leavers can access TELS to pursue and further their lifetime dream in any tertiary institution of their choice in Fiji including those who aspire to become a commercial pilot, all in the desire of our brave Government’s vision to making Fiji a literate, educated and smart country. 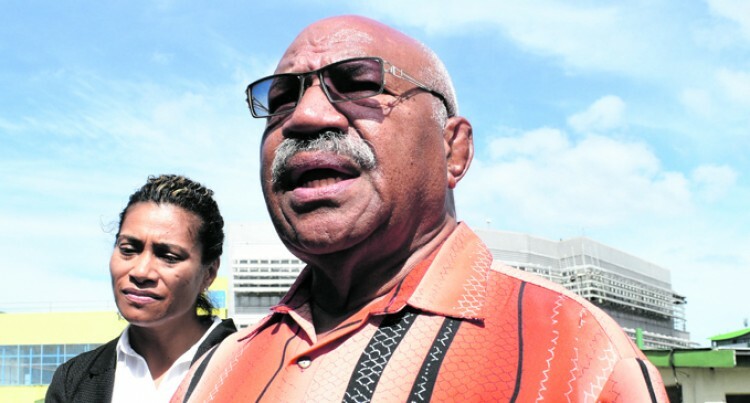 Rabuka’s desire to abolish the TELS and convert it to scholarships is nothing but a dream as our Fijian economy will be unable to sustain such boisterous ambitions. That will roughly equate to $250m per year and it is easier said than done. Foremost we all need to grow a vibrant and sustainable Fijian economy first with investment and stability should be the priority. His TELS election issue is a straight out desperate promise by him because it is unrealistic, impracticable and unfeasible. Happy to note they are certainly learning good governance from our FijiFirst team. I wish to ask the SODELPA leader why he was unable to implement such initiatives he now claims he will do, during his time as PM. Prime Minister Voreqe Bainimarama together with his dynamic government team, would have been able to provide Free Tertiary Education with effect from 2014 to all our future leaders, son’s and daughter’s if it was not burdened with the millions in debt accumulated from the NBF debacle and tragedy that he allowed to happen, which the Fijian people are still being subjected to paying till to date. Fijians have moved on. The majority Fijians will go to the polls soon. Fijians today interpret the budget as uplifting, inspiring and liberating. Rabuka should pay attention to the findings and read the Fiji Sun-Razor Opinion Polls, it is for real Siti and is your best indicator of what to expect pre and post-election. Most of the wheelchairs in use at the Nadi Hospital are in various stages of much needed repair or replacement. They are either without foot rests or badly worn out upholstery. A real sorry sight. Will some generous donors step forward, charitably for our less fortunate members of the community? Thanking you in earnest anticipation. Can the Fiji Roads Authority please spend a tiny portion of their $563.1m allocation to re-tarseal the Natabua road? This particular road should be in the Genius Book of Records as the most patched road in the world. Fiji has been elevated to very high levels globally through our leadership at various world forums. The whole world now understands that Fiji is no mean feat. We are a nation to be reckoned with through our sporting talents, academic world, leadership and politics, reformers, and many others. We may have some limitations, but smallness has never been an impediment. This is what Fiji needs. Leaders with a vision for all and a team of citizens striving for success. Lest we forget, our investors who have invested millions of dollars into the economy through their business activities, which in return has been able to sustain thousands of families and individuals through employment and other support services. As we enter a new fiscal year, may we progress with a duty of care for our environment, society, children, education, work and nation-building. Let not any negative force enter the horizons of nation building. Listen to all, but work within your conscience of your mind to gauge the right from the wrong. A seedling of hatred, jealousy and ill feelings planted now would produce a huge tree of the same kind hard to be plucked out later on. Let us live within our means and teach our young ones to do the same. Keep your children home when they should be and they will develop into good citizens under your care. God bless Fiji. 3. Direct all companies/work places to increase salaries/wages automatically by 15 per cent, as this is only about half of the cost of living adjustments for the last 12 years this government has been in power. If the above points cannot be added on, then Fiji’s 2018 Budget is only for about 25 per cent of Fijian families, including all the government ministers, their permanent secretaries, senior government officials, corporate company managers and senior executives. For the rest, it is just another day in paradise. The struggle to make ends meet will continue. And the Budget, just another exercise in futility. The FIFA football World Cup in Russia is so uncertain. World Cup champions and South American giants Argentina have exited. So as European champions Portugal, Spain and Germany. Old warhorse England is still on the hunt. No crystal ball to tell the future, only goals.